Lib Dems: Bouncing back from the dead in 2017? In 2015, the Liberal Democrats had a near death experience. But 2016 was the year there were signs of life - will 2017 be their year of resurrection? The vote to leave the EU has breathed fresh life into the UK's most pro-European major party. Last year they had a sensational by-election victory in Richmond Park, a modest increase in national polls, and won a clutch of council seats at by-elections. In 2017 they will be hoping to pick up more council seats and improve their national standing. As the most full-throated advocates of the 16m people who voted Remain, they have a fresh opening. But 2016's successes come from a low base. The party was nearly annihilated in 2015. They now have nine MPs and struggle to get airtime. Leader Tim Farron is secure in his job, following a year in which Labour, the Conservatives and the Greens all held leadership elections. UKIP even managed two. Prime Minister Theresa May is fairly popular with the public and Labour Leader Jeremy Corbyn is unpopular, polls suggest. But Mr Farron has another problem - almost half of voters have no opinion at all. The road to a Lib Dem recovery will be a long one, if it happens at all. After the referendum, Guardian columnist Rafael Behr spoke of "an unrecognised state - call it Remainia - whose people were divided between the Conservatives, Labour and Lib Dems; like a tribe whose homeland has been partitioned by some insouciant Victorian cartographer". The Lib Dems are hoping to win over some of these 16m lost tribesmen. Even though most backed Remain, Conservatives MPs are now largely united behind Theresa May's "Brexit means Brexit" stance. Labour MPs are divided. Though most backed Remain, many represent areas which voted to Leave. They do not want to be seen as circumventing voters' wishes. The Lib Dems have a unique approach: they want a second referendum on the terms of the Brexit deal. At the moment, there is no demonstrable appetite to refight the battles of June and hold another EU vote. But Mr Farron thinks that could change in 2017. The prime minister says she will kick-start divorce proceedings by the end of March. We know few details about the deal she wants but should it disappoint, the Lib Dems hope to pounce. 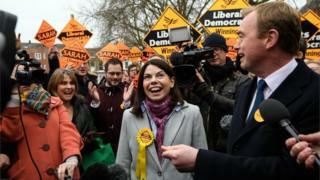 Sarah Olney's stunning by-election win on 1 December in Richmond Park was the best piece of news the Lib Dems had in years. She became the ninth Lib Dem MP, and the only woman. But this leafy south-west London seat, with more university graduates than anywhere else in Britain, is far from typical. The national referendum result was narrow but Remain votes piled up in big cities, affluent suburbs and Scotland. The Leave vote was more evenly spread. Although most MPs backed Remain, a large majority of constituencies voted to Leave. A Lib Dem win in Richmond Park does not make a national Brexit backlash. The party also picked up lots of seats at council by-elections in 2016. Further gains are likely in May's local elections. The party did terribly when the same seats were up for grabs four years ago. When the then Lib Dem leader Nick Clegg joined David Cameron in 2010 to form the country's first coalition government since World War Two, it was a bold move. But voters brutally punished Mr Clegg for his gamble. The party had not fallen below 17% of the vote in general elections since its formation in 1988, But it collapsed to 8% in May 2015, losing 49 of its 57 seats. The number of Lib Dem councillors halved between 2010 and 2015. Recently they have remained in the high single figures and low teens. One recent poll put them at dizzy heights of 14%. After some successes in 2016, Liberal Democrats should enjoy their seasonal break. But there are two reasons they should not get carried away. First, they were brutally punished for going into coalition government and are now doing better, far from the levers of power. If they form a government in the future, they may well be punished once more. Second, the party's liberal internationalist beliefs have taken a pounding over the past two years. Their core values are more unpopular than at any time in recent history. Analysis: Was Richmond Park by-election a vote on Brexit?